1. 23HP American Briggs & Stratton VANGUARD gasoline engine. International warranty local service. 2. Italian imported hydraulic parts. Makes HY200 mini loader high configuration and big working flow. 3. Joystick handle. Operating smoothly and comfortably. 4. Steering wheel operated and clear instructions. 5. One left pedal for attachments' lock-in. Two right pedals control machine's speed, stopping and back up. 6. Articulated steering chassis, drive easily. Seat with safety belt, safe and comfortable. 7. Quick hitch joints, HY200 mini loader can attach bucket, digger, auger, backhoe, hydraulic breaker, pallet forks, angle broom, sweeper,lawn mower, snow blower, stump grinder, tree spade, 4 in 1 bucket, leveler, dumping hopper, ripper, grapple , tiller, mixer, stone bucket, trailer, snow blade and so on. 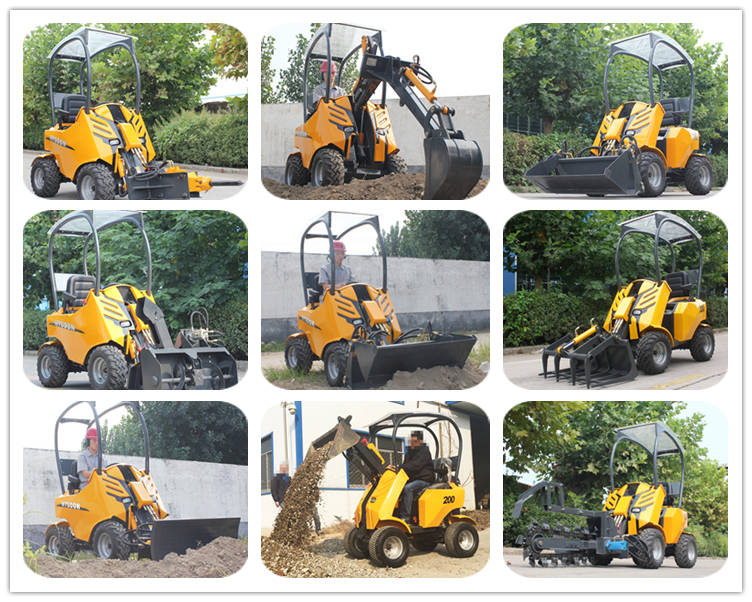 One loader can for various function, meet your different jobs.